The little beauty above, manufactured in France in 1885, just sold last friday at auction in Hershey Pennsylvania for over 4 million dollars. Not bad for a car that runs on wood chips to generate steam and whose top speed is an earth shattering 38 MPH. The price fetched, was indeed, almost double what the auction house had estimated. NO idea who bought it, but assume it was a well heeled collector or a museum. I find it fascinating that this car predates Henry Ford's first efforts by more than a decade. 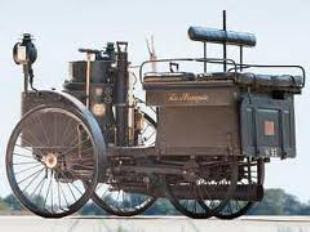 Even more interesting is that in the early days of the automobile, it was not clear that the internal combustion engine, was going to win out over steam or electricity. It was Henry Ford who made the difference by providing an affordable car with his Model T and the invention of the assembly line. He was kind of the Bill Gates rather than the Steve Jobs of his day. One wonders what would have happened had market conditions favored steam or electricity at the beginning of the automobile age. How many of today's problems could we have avoided ? We'll never know. But isn't it interesting that the world's oldest running automobile runs on steam not gas and is worth $4.6 million in today's market?